Question: How many times have you been at an awards ceremony / graduation / sports event / birthday party / concert when something awesome happens whilst you have a drink in your hands? 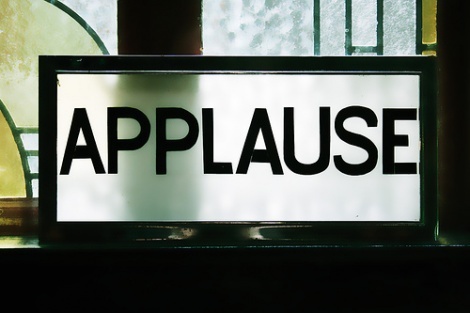 An effective one-handed clap is a skill that exists at the very frontier of cool science. Many have attempted but very few people have mastered it, and it is fraught with danger. It is a delicate balance of form and function. You need to be able to create enough sound with only one hand while at the same time not look like you’re having a seizure. And it’s different for everyone. Some people can generate enough noise by simply slapping their thigh. Others have found “good echo” from the crevasse on the side of their buttock, while still others shuck slapping altogether and resort to the two-finger-whistle (this is cheating and super annoying for those around you). Whichever way is most effective to you…. find it!!! The one-hand clap is a voodoo art and if you can discover it’s secrets, you’re a step closer to cool. This entry was posted on May 11, 2011 at 8:02 pm and is filed under skills. You can follow any responses to this entry through the RSS 2.0 feed. You can leave a response, or trackback from your own site.